Many of us have underutilized areas of our homes. You may have an empty corner of your attic or garage, or a spare bedroom used only for storage. Any of these places can make a good location for your gym—you don’t need any more than six by six feet of space to make a gym that works. 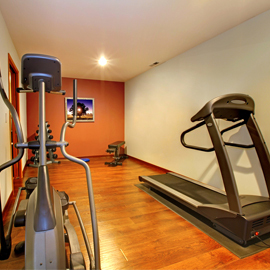 Still, your gym will benefit greatly from an invigorating ambiance that helps you stay focused on your workouts. If possible, include a window in your gym space, which will offers fresh air and natural light that can perk up a room considerably. Mirrors and houseplants can offer similar benefits if having a window isn’t possible. You should also have outlets for any electronics and equipment you intend on using and storage space to hold your unused gear. This may be the step you feared most, but you don’t necessarily have to drop hundreds of dollars on an exercise bike or weightlifting machine to get a good workout in your gym. Though these tools can be valuable if you use them frequently, you can still have a well-stocked gym without any fancy exercise contraptions. Pick up an inexpensive set of free weights, an exercise ball, a resistance band and a yoga mat. With these simple tools, you can do thousands of different exercises. The final step, and by far the most important, is to put your gym to use. Your gym won’t help you cut calories after lipotropic injections if it’s collecting dust, so spend as much time as possible exercising in your gym and enhancing the workout options available to you there. Have you built a home gym in Los Angeles or Bakersfield? Tell us about your personal gym in the comments below!